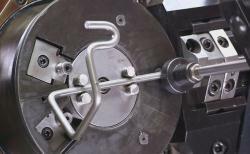 Servo technology is used in 3D bending machines. Usually they produce cheap products, so machine must be fast. There are 3 ½ axis in such machines controlled by an industrial PC. User produces the first item while machine records all movements in order to repeat the procedure automatically. Offline correction to the recorded program can be done as long as storing and browsing old programs.